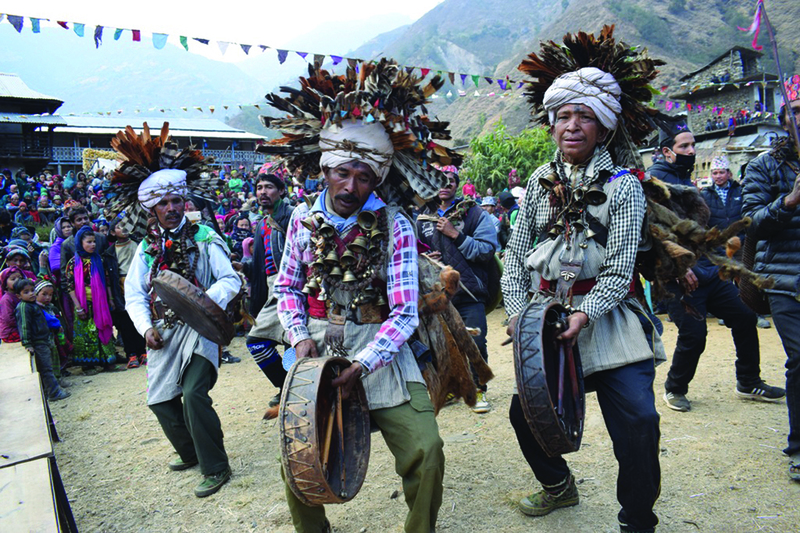 Shamans perform ritual dances while worshipping a local deity in Rolpa in this recent picture. 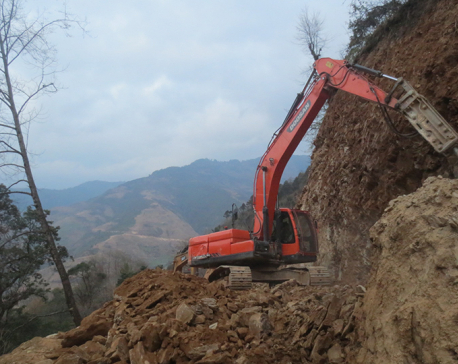 ROLPA, Jan 22: Ujal BK, 55, is a very busy man. He keeps traveling from one village to another carrying a bag filled with rudraksha, bells, traditional utensils, and some incense sticks. He is always clad in special attire with a necklace around his neck and a ragged pair of slippers in his feet. "My work is to cure people. When they get ill, they call me," he announces proudly. Of late, churches have become a highly sought-after place for people with an illness. However, shamans like BK have not lost their job yet. "Many churches have been established in recent years and many people throng to these churches seeking respite for illness. But I do not have time for myself. People call for me whenever they or their loved ones fall ill. They have faith in my powers," BK said. So far, BK 'has cured illnesses of many people.' Basically, children and women come to him. "And once I bring in a deity in my body, and when the deity speaks what the problem is, everything is cured," he narrated. "But sometimes, if the person fallen ill has not to be cured, then the deity does not do that for him or her." This safe statement has let BK go on with his profession for long without much hassle. If someone is not cured, he says that the deity was not impressed with the offerings made. "It happens that way, I am not exaggerating," he said. According to BK, there are some mantras which he recites to treat patients. And he does his best while chanting such mantras and following other rituals. As such with the help of the mantras and rituals he has 'cured countless people' with the 'blessings' of the deity, he shared. Interestingly, BK claimed that a huge number of his clients are the patients who were not cured at hospitals. When it is not in the hand of doctors, shamans are needed, he said. "It is not easy to perform a healing puja. It takes a whole night to perform all the rituals," he said. Also according to Farke BK, another shaman from Rolpa, his job has never been easy. There are a few like him who are still into it, or else, many have done away with this skill their grandfathers taught them. "We were taught by our father and grandfather. But after us, there is no one to carry it further. This skill will die with us," he lamented. Farke was not ready to believe that patients need medical doctors instead of shamans. 'At least not all patients need shaman'. "See, I can bring you many cases of people turning back to shamans after their doctors disappointed them. I have personally cured many such patients," he claimed. Access to health posts as well as the growing craze of adopting Christianity among the locals is posing threat to shaman's job, according to Farke. "And it is natural that today's young boys are simply not interested in learning such things." Thus, though fewer people are looking for shamans these days, shamans are not yet out of the job as their number has also shrunk to only a very few. While in the older days, there would be dozens of shamans in a village, there are only a few left in the entire district, he assumes. "When the night sets in, our work begins. We tremble and chant mantra through the entire night. We use materials available in most of the household to perform the puja. So, it is not hard for any household to make arrangements for the rituals," said Firke. "Since this is something we have been doing since generations, it comes easily to us. Other works are difficult." According to Firke, some spirits possessing a person are very strong and they do not readily agree to release the patient from its clutches. In such a situation, it takes a greater effort on their part to put pressure on the spirit to free the patient of its possession. "We have to try very hard in some cases. When the evil spirit is very strong, they actually challenge us and then a shaman with normal powers cannot force the spirit to free the patient of its posession," he said. Firke considers himself a very powerful shaman. And thus, he feels he is capable of chasing away any kind of evil spirits. Yet, another shaman Tuday BK claims that he is no less than any other shaman. He too claims of having years of experience relieving patients from very dark and powerful spirits. 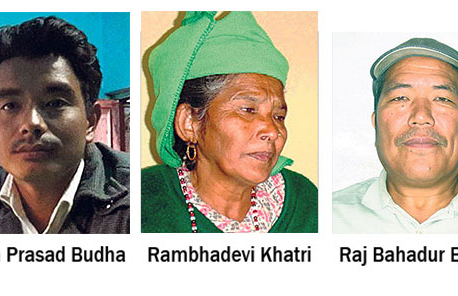 "If I stay and perform puja whole night, I can chase away any kind of evil spirit," he said. Shamans not only attract people and cattle with illnesses. They are also curiously watched by tourists. The way shamans perform quite amuse tourists when they perform for a patient or while worshipping local deities that they worship.